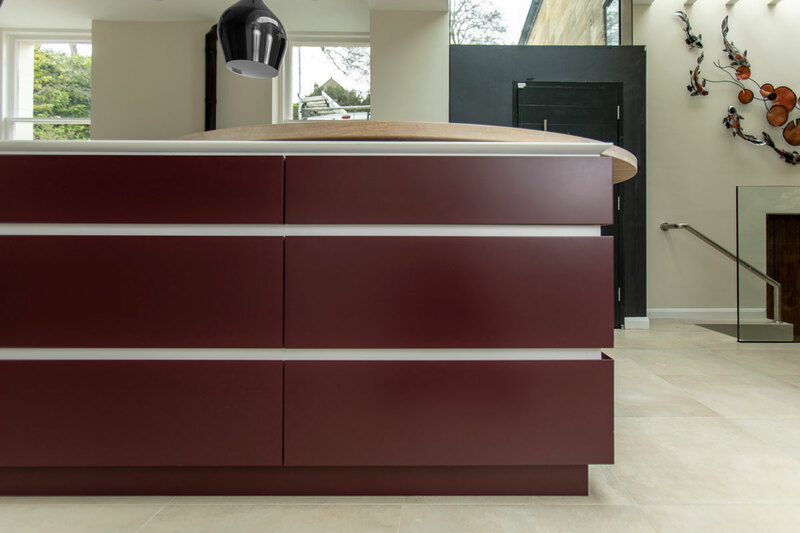 A modern kitchen with Corian worktops and a Brinjal coloured island. Our clients live in a very beautiful period home, a 19th-century former vicarage, in an elevated position overlooking the Wiltshire countryside. After creating their furniture a few years ago, we were asked back to create a kitchen for their extension. One that would perfectly blend functionality with form and fulfil our clients’ needs in a very creative way. From the offset, an island was key to their kitchen. While they had a formal dining room, they would generally eat at the kitchen island when not entertaining. As such, it needed to be of sufficient size to unite the living and kitchen spaces, provide ample storage and seat up to five people. However, as it would usually just be the couple sitting at it, we didn’t want the island to be too large. The dimensions of the room meant that this was all a bit tricky. 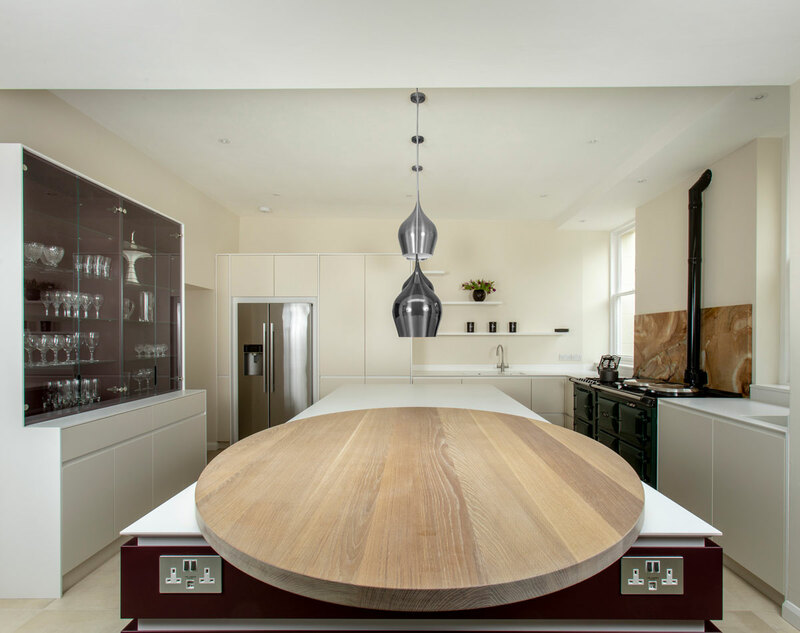 As such, after many design options for a shaped breakfast bar, we came up with the idea of an oval oak breakfast bar that could rotate from the island. In its default position, it allows two people to sit at it, with plenty of space around for walking past. When rotated 90 degrees, it allows for five people. We fabricated our own rotating system, routered into the underside of the top, and pivoting from a metal rod housed into the Corian island. This in itself was very innovative and something we’ve personally never seen before. The system locks into place and secures to avoid any wobble or movement. The clients were over the moon, as were we. 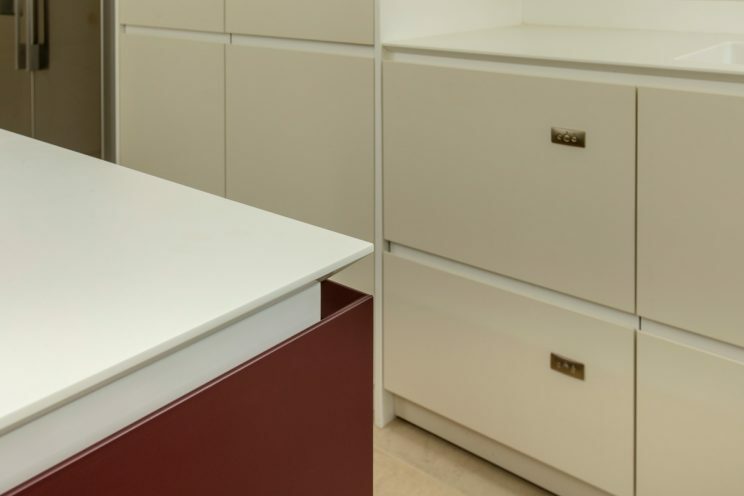 Corian featured heavily in our design, as our clients loved the look and texture of the material. The size of the island also meant that no other material could be used without a visible joint. The sinks were also in Corian and we used a sharknose edge profile to give the impression of thin and linear lines. We inset Corian into the finger grooves too, to improve durability. The effect of white Corian tops with the white linear finger grooves flowing around in two lines worked really nicely. We kept all corners as sharp as we could to enhance the minimal, slab, clean aesthetic. The dresser was also made entirely of Corian, with glass doors. This was a tricky piece – it was fitted to the wonky walls so lots of Corian scribing on site and joining invisibly. One little touch that we really like is the mitred corners on the drawers and end panels on the island – this allows the horizontal finger pull lines in Corian to flow all around, uninterrupted. 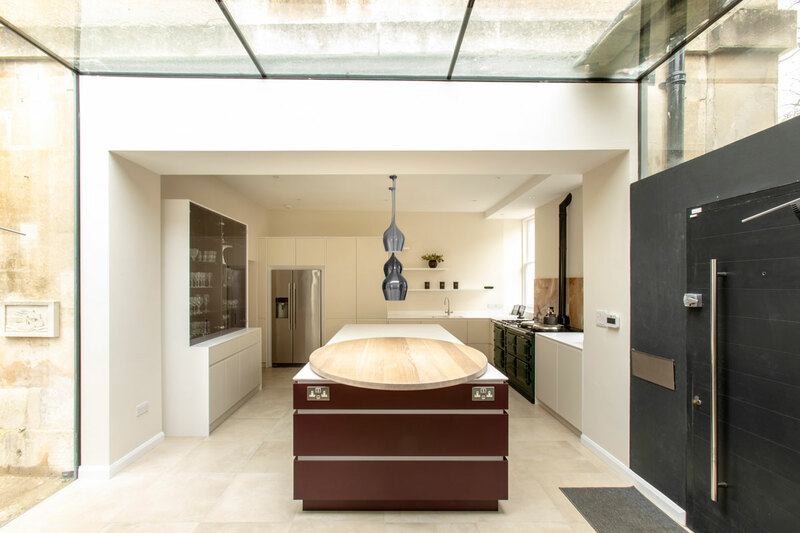 We also designed and created a cook centre with large pocket doors to keep the food processor out of sight. Our client is an excellent baker, but this messy art is sometimes best kept behind closed doors in a modern kitchen design. 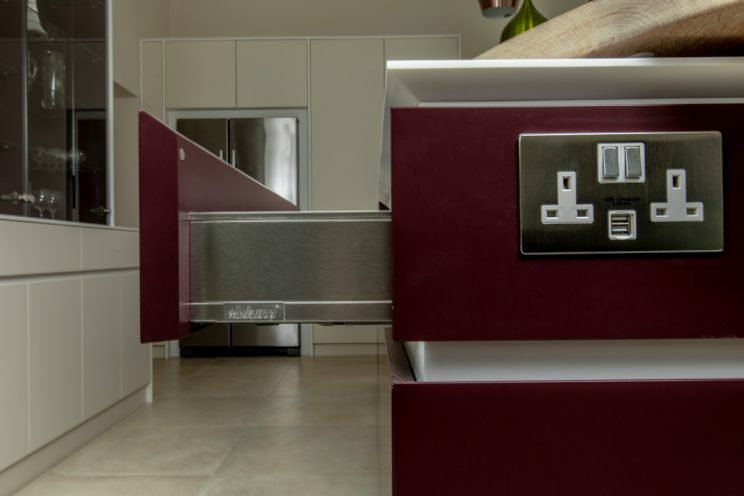 We chose colours carefully and the Brinjal island complemented the client’s bold choice of AGA. 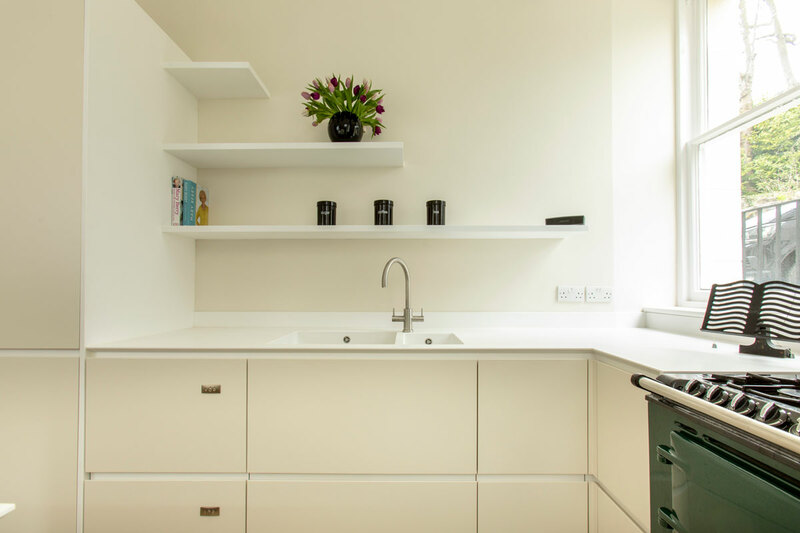 The clients chose a Fisher & Paykel fridge and integrated dishwasher, Abode taps and a Siemens oven. 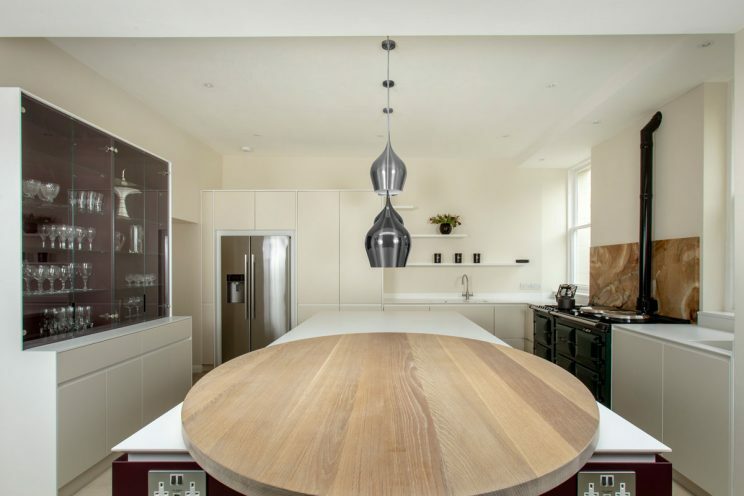 The clients were thrilled with the functionality and look of the kitchen. We delivered something really unique – challenging to make – but something to be proud of.